AMD’s Catalyst 15.7 WHQL driver release brings DX12 and FreeSync CrossfireX support, extends VSR and FRTC compatibility to older GPUs. The extensive list of features as well as performance improvements that AMD’s Catalyst 15.6 WHQL driver introduces makes it the company’s biggest driver update since the Omega driver released which came out late last year. This new driver release brings support for AMD’s latest Radeon 300 series and previous Radeon GPUs under one roof. Which were previously bifurcated to two non-crosscompatible driver releases, 15.15 for the 300 series and 15.5 for previous graphics cards. 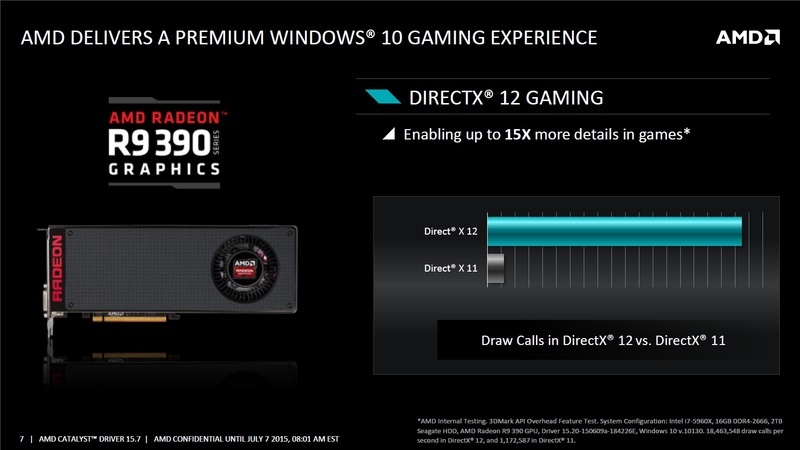 Interestingly, because the new 15.7 drivers are compatible with all of AMD’s graphics cards – except legacy products – it also enables CrossfireX compatibility between 300 and 200 series graphics cards based on GCN GPUs that feature identical configurations ( identical GCN core counts, texture units, ROPs etc ). For example the R9 380 should now be compatible with the R9 285, the R7 370 with the R7 265 and the R9 390 series with the R9 290 series. The differences in GPU core and VRAM clock speeds may produce varying results however. Back to the feature list of the new drivers. Let’s first discuss FRTC which is short for Frame Rate Target Control. 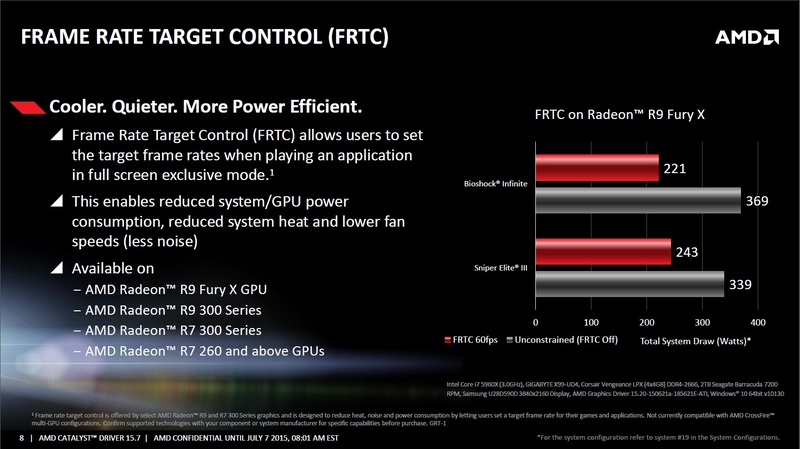 This new features allows the user to predefined a maximum frame rate target that the GPU will not exceed once applied. The benefits are realized by reducing the unnecessary load which is put on the GPU while running non intensive games. This in turn means that the GPU will no longer render an extra frames beyond the limit set by the user. As a result the GPU will consume less power and run at lower temperatures. FRTC was a 300 series exclusive feature in AMD’s Catalyst 15.15 driver, because that particular driver release was only compatible with AMD Radeon 300 series products. Fortunately AMD has now brought this feature to the AMD Radeon 200 series graphics cards as well in this latest 15.7 driver update. The second major feature update this driver brings to the table is the extension of VSR – Virtual Super Resolution – support to older GCN based graphics cards. 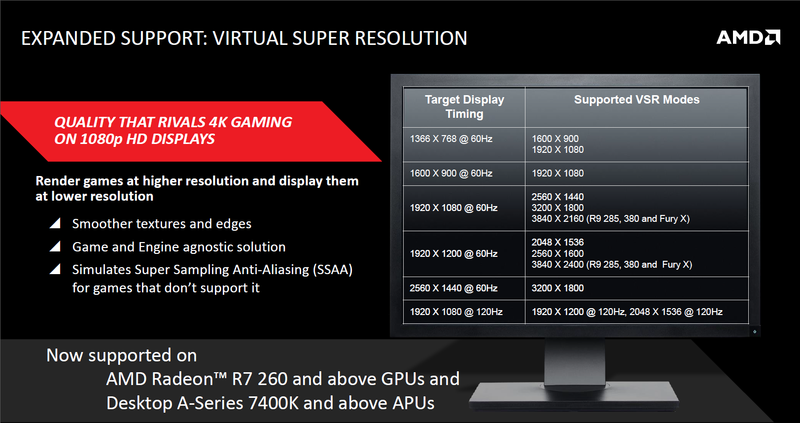 This feature was previously limited to AMD’s GCN 1.1 and GCN 1.2 based graphics chips. So the R9 390 series, R9 380 series, R9 290 series, R9 285 and R7 260 series. The 15.7 update extends FRTC compatibility to almost all 300 series, 200 series and HD 7000 series Radeon graphics cards. This brings us to the third major feature update. Catalyst 15.7 finally brings FreeSync compatibility to multi GPU Crossfire configurations. This brings us to the final major goodie in the Catalyst 15.7 WHQL driver package. And that’s DX12 Windows 10 driver support. This is the first WHQL signed driver from AMD to introduce DX12 support and it arrived just in time before Mcirosoft’s upcoming official WIndows 10 release this month. Below you will find the release notes for the driver with details about all the previously discussed features as well as newly introduced game specific performance improvements and Crossfire profile updates. This article provides information on the latest posting of the AMD Catalyst™ Software Suite, AMD Catalyst™ 15.7. 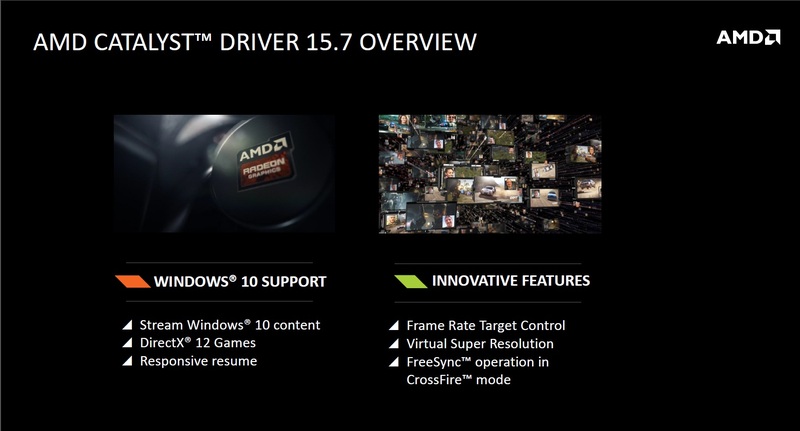 The AMD Catalyst™ 15.7 driver ​is compatible with the following AMD products. ​NOTE: To ensure stability, users should upgrade to the latest available Windows® 10 Technical Preview build provided by Microsoft before installing AMD Catalyst™ 15.7. 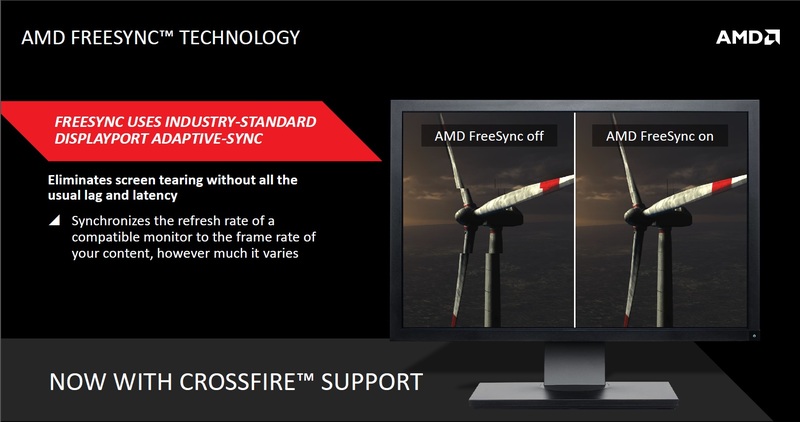 ​​AMD FreeSync™ and AMD CrossFire™ can now be used together in applications using DirectX® 10 or higher. Please note, this feature is currently not supported on systems configured in AMD Dual Graphics mode.